It seems counterintuitive: More insured patients should mean greater financial stability for providers. But while the rate of uninsured Americans drops, the out-of-pocket costs for many patients have skyrocketed over the past few years. And because a majority of Americans don’t have any savings and 57% of us couldn’t come up with $500 to cover a medical bill without going into debt, healthcare providers are feeling the negative impacts of bad debt, increased time and cost to collect, and a loss of market share. In 2016, 68% of patients didn’t pay their medical bills to completion. Patients making even a partial payment is on the decline as well. That’s a lot of money left on the table, and a lot of bad debt for providers. Worse, the problem is not going to get better anytime soon. Transunion projects that by 2020, the number of patients not paying their medical debt in full could be 95%. A largely unnoticed, but crucially important, impact of rising patient financial responsibility is the toll it takes on revenue cycle employees, particularly those on the front lines of patient interaction. As we discussed in Part 1, collecting from patients is more complicated and time consuming than collecting from large insurance companies or governmental organizations. Even though this trend continues upward, many RCM departments haven’t staffed up to meet the increased demand, which means the same number of people are doing larger amounts of work. Combine all of that with a huge jump in the number of daily conflicts RCM employees face with patients who can’t pay their bills or are frustrated that they have a bill at all. This leads to stress, errors, and job dissatisfaction, which can lead to staff turnover—another expense for providers. As patients assume more responsibility for their healthcare expenses, they get pickier about the services they receive. They begin making decisions about where they receive their care based on cost, quality, and the interactions they have with providers throughout the course of their care—from admissions to final payment. There is good evidence suggesting that patients who are satisfied with their care—including their billing experience—are more likely to pay their bills in full, return for future services, and recommend the provider to friends and family. Not surprisingly, dissatisfied patients are less likely to pay their bills and more likely to find a new place to get their health care needs met. In an increasingly competitive market, losing patients due to dissatisfaction has enormous financial consequences. Providers who ensure a good patient experience from start to finish will be the winners in this market. 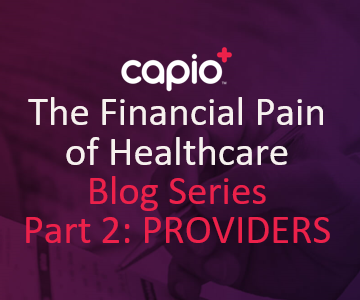 Now that we’ve seen evidence for how rising patient financial responsibility is impacting both patients and providers, it’s time look for possible solutions. We’ll do that in Part 3.